The most we can ever hope for from Fox News is that the network will ignore climate change completely, because every time it brings the topic up, something like this happens. 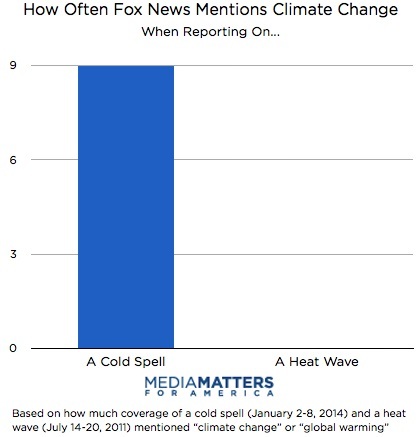 During last week's polar vortex, however, Fox reporters were on it, mentioning the topic much more often than their counterparts at CNN and MSNBC. And they took every opportunity available to cast doubt upon whether it's happening. That's right, not even once. It was the same story for all of July 2012 -- the nation's hottest month on record -- during which Fox gave a single shout-out to climate change, and then only to insist that it had nothing to do with the record heat. Got that? According to Fox News, cold weather is evidence disproving what an overwhelming consensus of climate scientists says is true; hot weather is just weather. The truth is something more like this: Though it's easy to be fooled by the weather, one bout of cold does not a climate trend reverse. And a growing body of climate science suggests that rising temperatures may be responsible for all of our extreme weather -- the heat waves and the cold spells.